Taz Entertainments will at Oswaldtwistle Mills on Friday 12th April for our Kids Half Term Events. 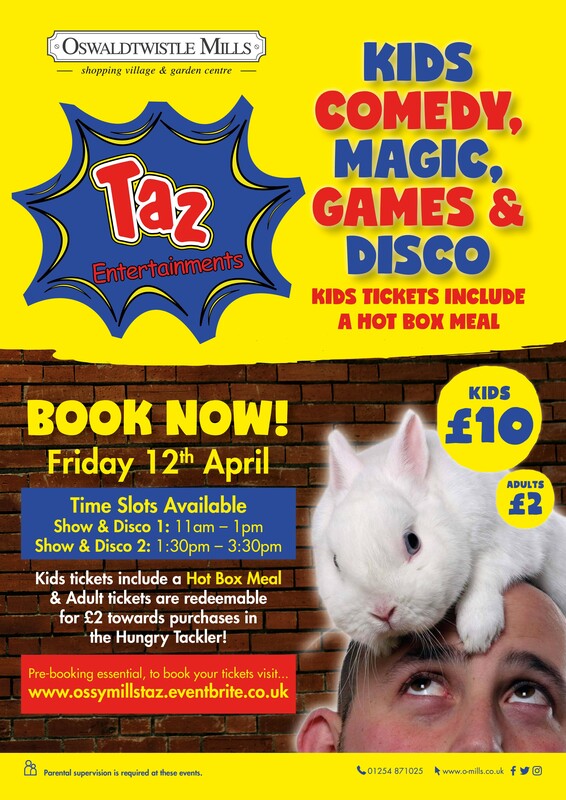 Two hours of madness as the kids are entertained by Taz with his fantastic mixture of kids Comedy, Magic, Music & Games, plus a break for refreshments (Kids tickets include a FREE Hot Box Meal from the Hungry Tackler Resturant). The first half of the show consists of disco dancing and games including some old favourites and some modern classics. At the end of the games and dances, the kids then have a short break to catch their breath enjoy a FREE Hot Box Meal. After the food is a magic show and a chance to meet Bob the Rabbit! Babies under 9 months FREE. *Parental supervision is required at these events.